When you think of a town or city drenched in snow, your heart generally skips a beat and you instantly feel warm, cosy and a bit Christmassy. Or is that just me? The twinkling lights and magical streets filled with a blanket of pure white heaven is not just superb, but hugely enticing. What you don’t think about though are the heating problems, the amount of electricity needed to keep the lights in action and the constant surge in power that starts to cause problems for the economy; let alone having to worry about keeping the roads clear as it keeps bloody snowing all the time? AHHHHH… damn you winter. But welcome to the wonderful world of Snowfall. 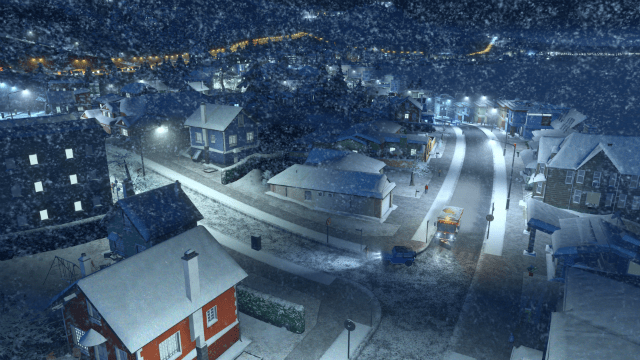 Snowfall is the second DLC pack for Cities Skyline, but you won’t find me talking about the main game here, as you can read my full review if you haven’t yet played it. The long and short of it though is that I loved it. The addition of a new piece of content therefore is a bit of a big deal, and it’s most definitely a big package. The first mistake I made though was loading up my favourite city and sitting back as I waited for it to start snowing. Four hours later, I realised that in order to benefit from the new DLC, I had to start from scratch. They were a good four hours though. Snowfall lets you choose from three snow filled maps to begin with, and straight away the world looks magical and like a winter wonderland. But reality will hit pretty soon. You need to build your city in the normal way – you know, the same way that you’ve gotten used to throughout the main campaign. But be wary, because soon the temperature gauge starts to drop and the electricity usage starts to rise and rise, which means more power and some tough decisions to make. Then there are the roads of course, which require the use of an army of snow ploughs to keep the highways free. Any slight mishap and you’ll have found yourself leaving half the population freezing to death, which isn’t ideal for a community that I named Snowflake Heaven. It has to be said, Snowfall is much tougher than before and you have to use your brain in a whole new way if you wish to be successful and keep the city safe. You need to employ some new tricks to keep the residents warm, and these include dealing with city policies that ensure every new building has insulation added in. When it comes to power – and if you still want to keep things eco-friendly – then there are Geothermal plants with a whole new piping system to explore. These will see you spending an arm and a leg as you attempt to upgrade all your piping from old to new, so be aware of that while designing the early stages of your city. Other features include a number of theme based content additions to all your shops, factories and buildings, whilst there are new features to buy, like a sauna and a tram section that is brilliant. But keeping the death toll down gets very hard and taxing, and the constant blackouts will see you having to delve into the world of trial and error before starting over again and again. The gameplay found in Snowfall is as good as I remember from the base game and (whisper it) it does seem much faster than before, now that we’ve got the power of Xbox One X behind it, with no slow down on any of the graphical enhancements. The extra elements are not groundbreaking, but they are enough to give the expert city planners amongst you an extra new challenge. 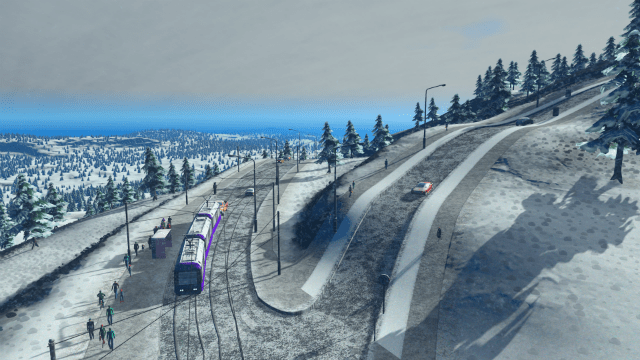 Visually and Cities Skylines still looks amazing but with the snow effects, the ability to zoom in and out from the smallest detail to the overall map in a blink, it is still something I will never get bored of. It looks extremely magical at night and then there are nice little touches included, like the ability to change the menu bird into a winter version. The soundtrack is still epic and inspiring, while seeming to fit perfectly within the winter theme. Overall this is a welcome addition to the DLC programme planned for Cities Skylines. 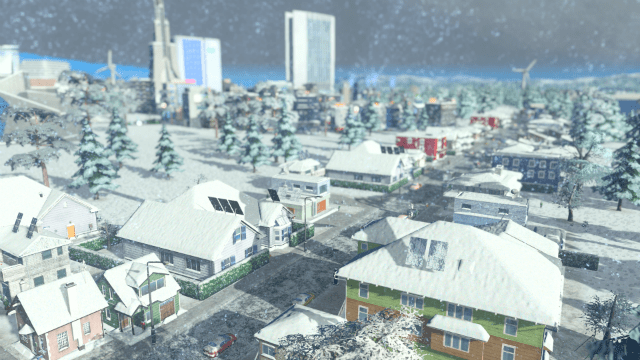 Snowfall gives you a totally new aesthetic design and presents a number of challenging new ideas in the way you design your city from scratch. I would have liked to have seen it incorporated into my original city, but actually starting again from scratch was very enjoyable, especially when taking into account the new challenges ahead. People will die, power with be lost and saunas will need to be built, and for the experts amongst you this will be easy, but for others it’s hard to keep the books balanced and the residents happy. It’s a bit of a pricey add-on though, unless you’ve bought the season pass, and whilst I’m already really looking forward to the Major Disasters content that is due up next, for now it’s all about zipping up my thermal coat, getting out into the snow and upgrading my pipes. I am an actor and a writer. I act quite a bit on stage, a little bit on tv and never on tuesdays. I have had some of my writing published and have written for TV and stage. I have been playing games since they begun and don't seem to be getting any better.